This e-mail is to inform you that a Community Meeting has been scheduled to discuss the land use proposal described below. This Community Meeting is required by the County in order to provide for an information exchange between the applicant and community members. The Community Meeting is facilitated by the applicant, however a representative from the Planning and Zoning Division will attend the meeting to provide information to the attendees regarding County process and regulations. The County has not received a formal application for this land use proposal. Information related to this request may be found here. Type of Application: Community Meeting to discuss requested rezoning from Commercial-One (C-1) to Planned Development (PD) to allow for the Pine Grove History Park. Additional information related to this case can be viewed here. Some of the links on this page that may be helpful are the links to the case file (public documents), to the Jeffco mapping system (jMap) and to the case tracking system (general application details). Get emails regarding community info such as events, planning & zoning etc. 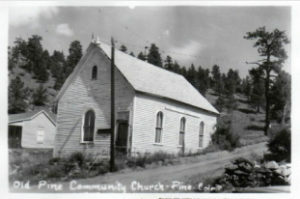 PECIA owns and maintains the Pine Community Center, the second oldest church building in Jefferson County. ©2018 Pine-Elk Creek Improvement Association. All Rights Reserved.